Mercury Glass chalice (mine was 6.5 inches H x 4 inches D.
Think silver and candlelight and you will catch the inspiration for this centerpiece. 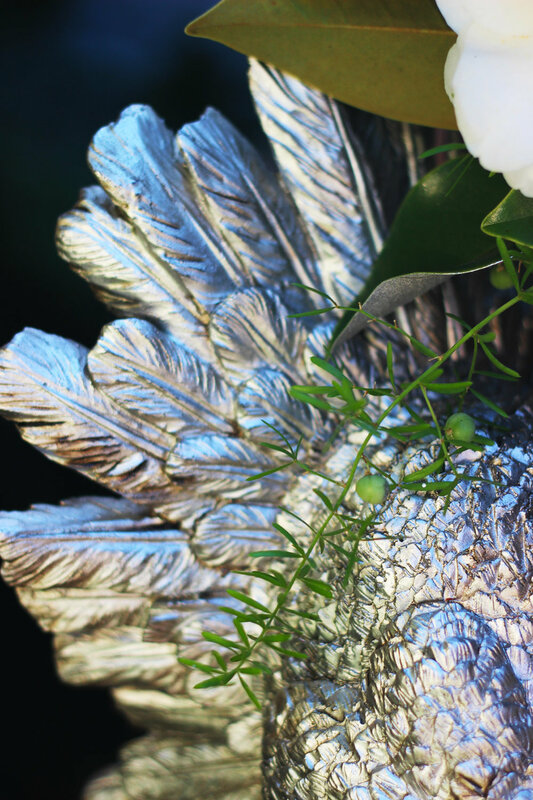 In keeping with the Holiday theme, this centerpiece is constructed with magnolia leaves, some of which have the tip or back sprayed metallic silver. It also has 2 Magnolia seed pods along with three Lotus pods sprayed metallic silver. It is shown with a silver turkey, silver patterned glass votives with floating tea lights and little glass and faux pumpkins. The flowers used are cut from my garden. These white camellias have a very decorative golden fringe in the center. 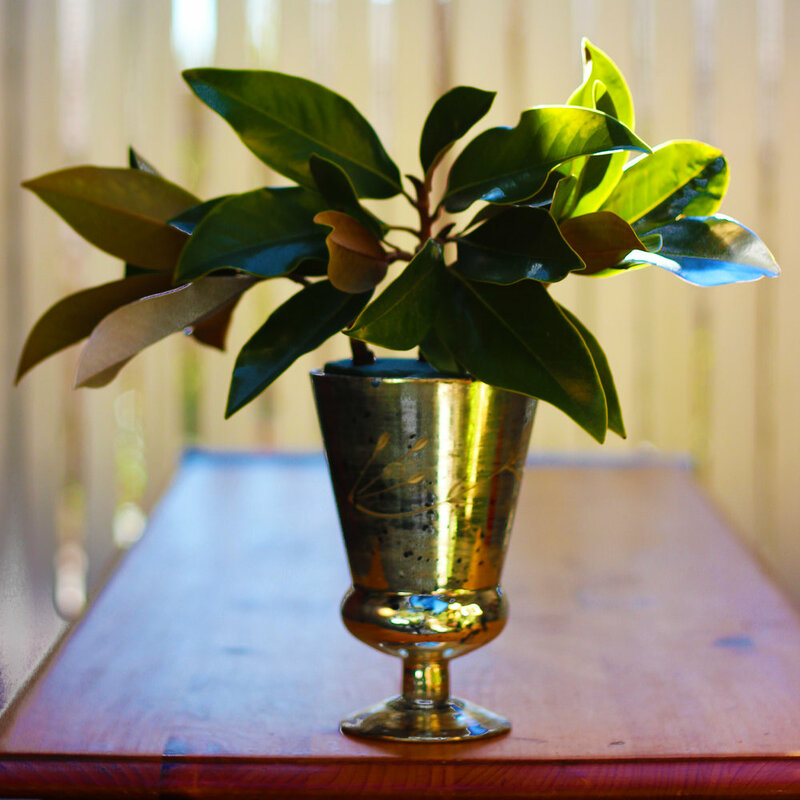 When you spray your magnolia leaves and pods, make sure to spray them outside on the ground, and put down a garbage bag or newspaper to catch the over-spray unless you want to have a silver abstract design on your lawn. If you have you spray paint, greens, flowers, and silver, we are ready. Let's begin. 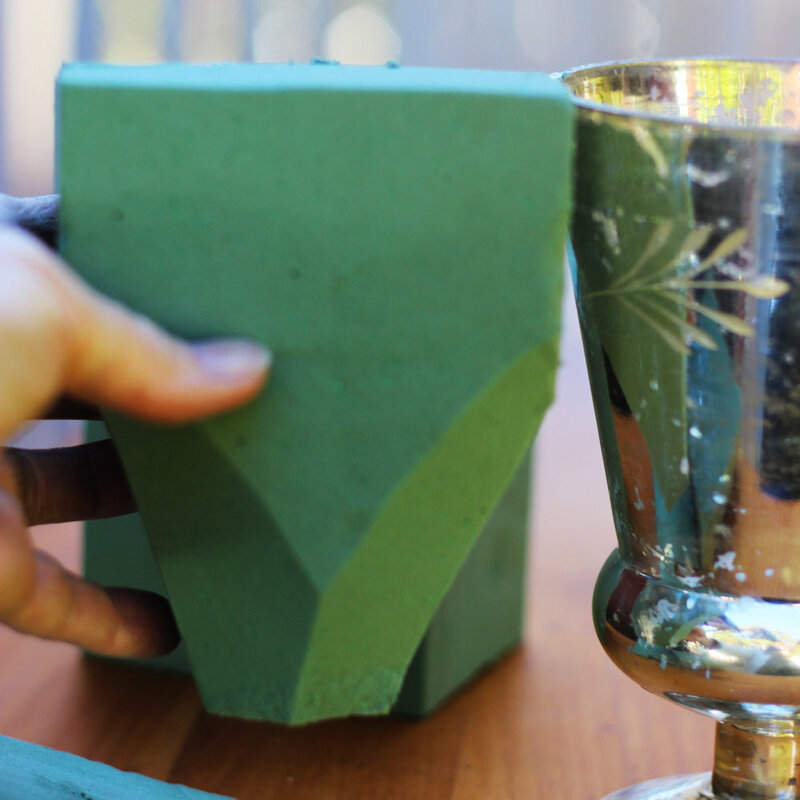 Use a produce knife cut the floral foam to fit the shape of the chalice. 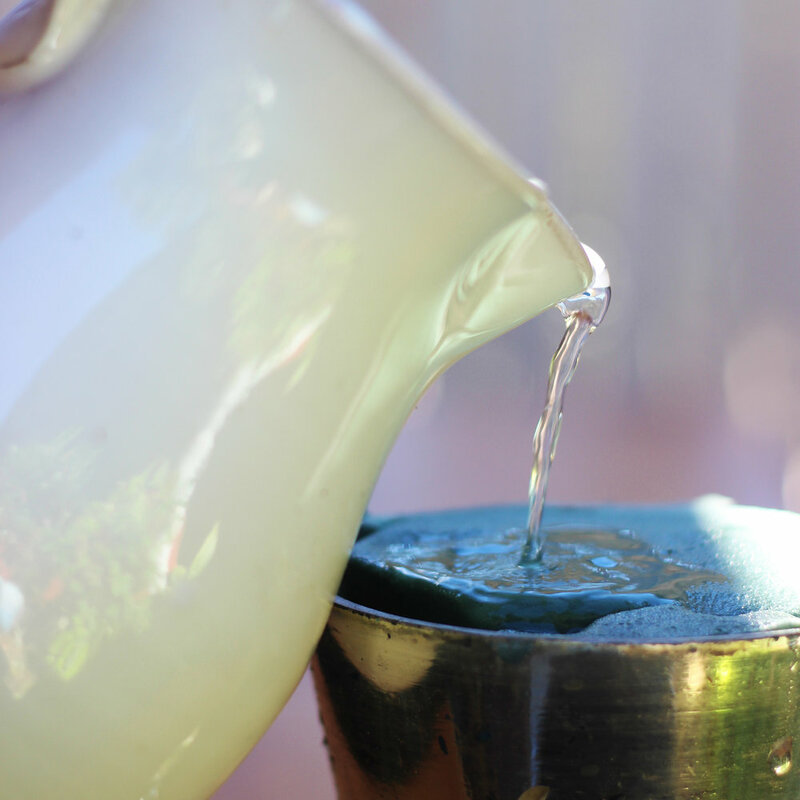 Fill with water to the top. It will hold a lot. 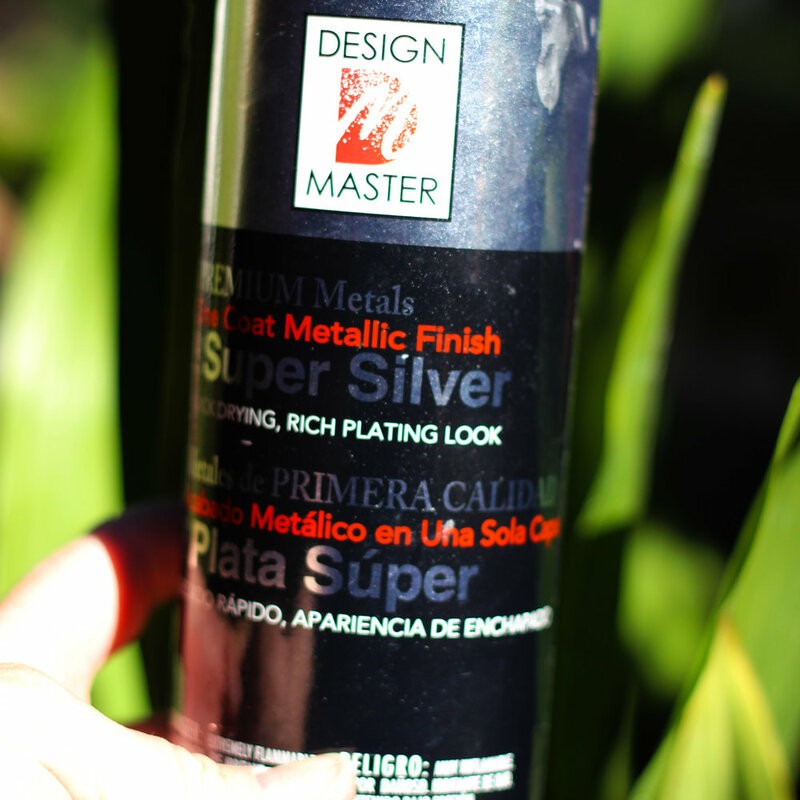 Use Design Master Metallic Finish Super Silver to spray leaves and pods. Use extra leaf as stencil. Hold 3/4 inch down from tip. Spray tip of underneath leaf silver. Spray back of a leaf silver where the back will be showing. Put Magnolia leaves left, right, and then center front. Place Magnolia stem center back as well. Use floral stripper and take off leaves and thorn from Asparagus fern 5 inches from the end. Be careful, thorns are sharp. Insert on side and have it cross over and go down opposite side. Repeat on other side. Cut 5 - 6 camellias. Cut stems as long as possible, from 6.5 - 11 inches. Cut 2 buds that are starting to open and their foliage. These are 9 inches long. 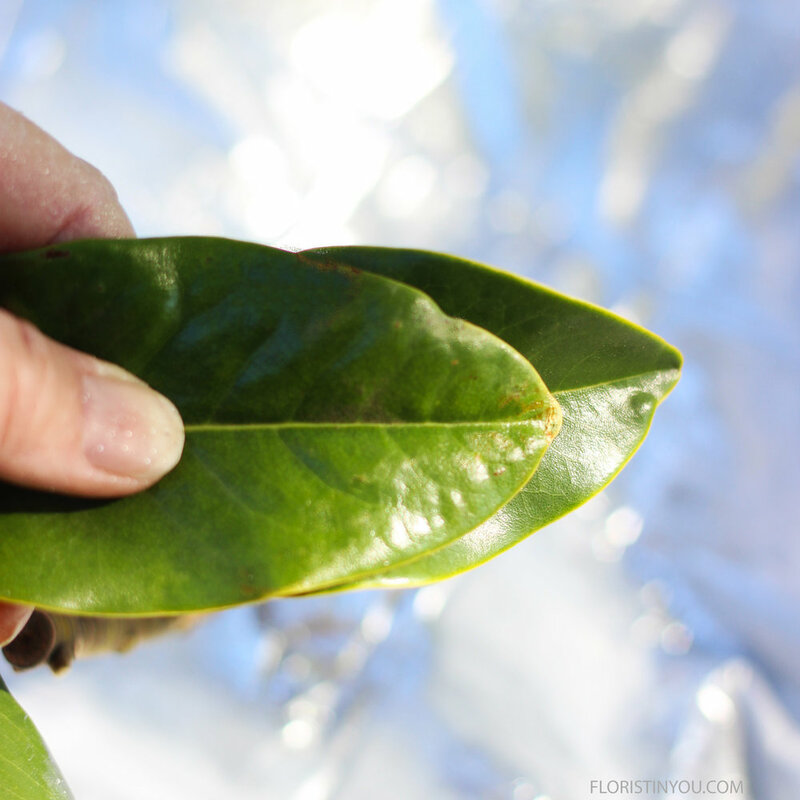 If cut from a garden, wash camellia leaves being careful not to get flower wet. Dry the leaves with a paper towel. Place a large camellia front and center. Add one to the left and one to the right. Add 2 buds left and right in the middle of the arrangement. Add Lotus pods and seed pod on right. 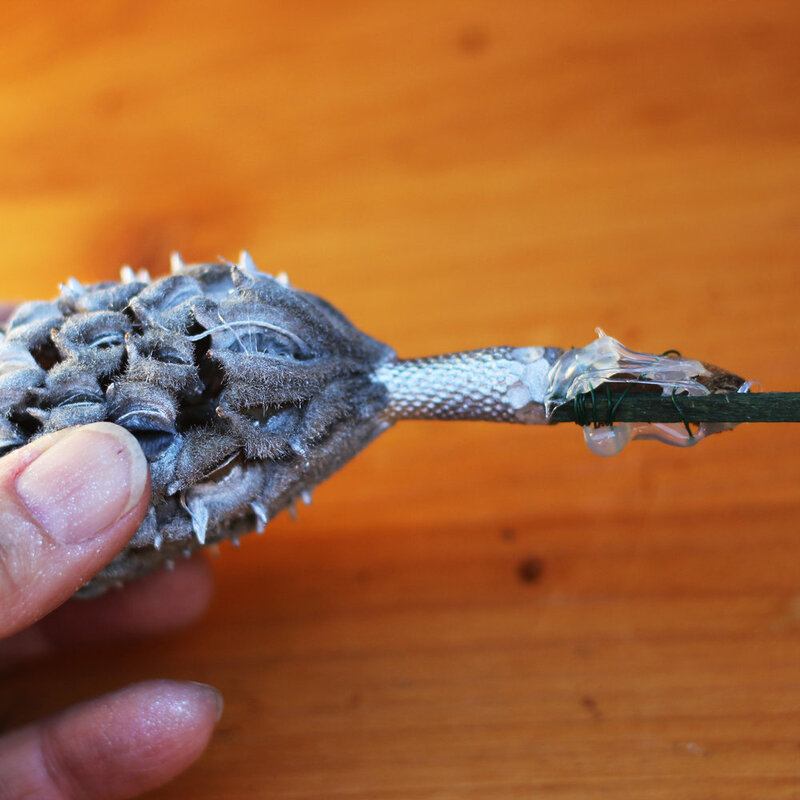 If seed cone breaks off, wire it on a pick and then hot glue it on both sides to secure it. Insert seed pod on right. Add your silver turkey, pumpkins, tray, and silver patterned votives for your table setting. Pine gives a great holiday scent and atmosphere. The silver Lotus pods look brilliant. The floating candles add sparkle and atmosphere. Don't forget all sides of your arrangement! You can see the little 'peas' on the Asparagus Fern. Wow, the Lotus pods are so cool. The metallic silver gives a wonderful sparkle and finish, tying the whole arrangement together. Enjoy the holidays with these silver beauties.